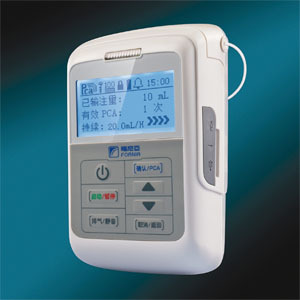 Fornia Electronic infusion pump consist of principal machine and reservoir. The reusable principal machine is embedded with highly intelligentchips to provide humanized control, complete functions and easy operation. Disposable reservoir is available in a variety of capacity including 100ml, 175ml and 250ml. It is mainly used for intravenous and epidural administration to suit various clinical micro-injection including preoperative sedation, intra-operative and postoperative analgesia and chronic pain treatment. Administration Intelligent programming and multiple peristaltic nozzles guarantee as high precision infusion as 0.1ml/h. All the parameters can be set up on demand. Arbitrary combination of loading dose + continuous dose + PCA dose,multiple administration modes for individual treatment. Information memory function for infusion quantity,administration time, accumulative dose and faults, etc. Thorough security protection Infusion limit per unit time; PCA time intervallock; password and keyboard lock; automatic prompt function-- clogging, battery information and faults, etc; precise outtake filter to eliminate particles in the liquid medicine and discharge the gas. Reminding function Pill in case, low battery, administration completed, etc. Automatic memory Infusion record, PCA, and times remained, etc. Protection function Keyboard locked, tube clogging alarm, etc.